It’s grilling season! Have you heard of wood pellet grills? We used to have a small one at our office for Cookout Fridays…which was great! It really gave a wonderful smoky flavor to our food. Like any grill, the cost ranges from a few hundred dollars to a few thousand. The one pictured to the left is from Costco (courtesy of the Costco Couple). 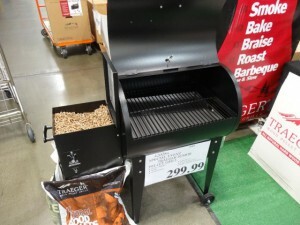 Even if you don’t have a wood pellet grill – you might have a grill in general. We have compiled a list of 10 really nifty grill accessories. Some really useful, and some a little over the top. Aside from the usual ash removal and general maintenance, your wood pellet stove needs additional care in order to operate efficiently and safely. Although many stove owners believe their own cleaning techniques are sufficient, and some perhaps are, the fact remains that some things should be left to trained professionals. Think of it like service for a car. There are some car owners who can adequately handle his or her own engine service. However, engines are typically best taken care of within the hands of honest, experienced professionals. Check out this pellet stove chimney clog to the left. Just because pellet stoves burn with less creosote buildup than wood stoves, it doesn’t mean the stove doesn’t need attention. 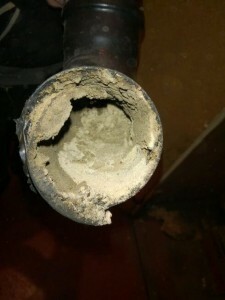 (The picture is from a stove with over four years with no professional cleaning and inspection.) Dramatic, perhaps…but you get our point. We have broken down the 8 steps needed to keep your pellet stove running safe and at optimal efficiency. What is the Flex Savings Plan? Introduced in February of 2013, the Flex Savings Plan has quickly become very popular among our customers. We understand that buying your annual wood pellet fuel is typically a large purchase, one that may cause financial stress. Therefore, we created this Flex Savings plan to help budget that large annual fuel purchase by making it much easier to save. The Flex Savings Plan allows you to make a monthly deposit in any amount you are comfortable with. This stretches out your wood pellet fuel purchase over months, instead of a single large one-time payment. Each monthly deposit is applied to your personal PelletBucks credit account. You’ll receive an automatic email statement for every deposit that shows your account balance. And when you’re ready to order your wood pellets, your PelletBucks credit amount will be automatically applied to your order balance. No lump-sum payment required. Your wallet will thank you! No catch. This plan is just a way to help you chip away at your annual fuel purchase. There’s no interest and you can stop at any time. If you do decide to stop for whatever reason…we will refund the money you have paid (minus a 5% electronic handling charge).